Boss RC-1-BK Loop Station - Limited Edition Black The Boss RC-1-BK is a special commemorative pedal that celebrates the sales of over one million Loop Stations to date. Based on the popular RC-1, the limited-edition RC-1-BK features a black finish with red lettering, and will be available in 2018 only. Other than the color, it's identical to the standard RC-1, the top-selling model in the Loop Station lineup. 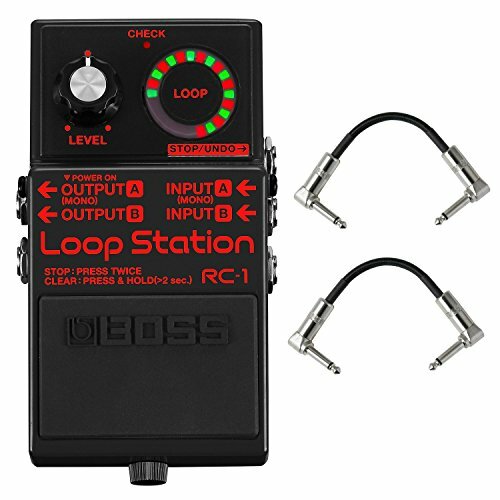 The BOSS RC-1 is Boss's simplest and most user-friendly Loop Station ever, and it's a ton of fun! Since the RC-20 Loop Station was first released in 2001, BOSS has led the way by continually releasing new looping products. Though they've been used and enjoyed by various looping artists and performers, BOSS still pursued an easier and more affordable solution. The RC-1 is a straightforward looper that is easy to operate. Experience the fun of looping when you record, playback, overdub, and undo or redo loops using this compact BOSS stompbox. And of course, the RC-1 retains the BOSS quality and performance that musicians around the world have come to expect and rely on. On the top panel, there is a new and innovative loop indicator, which consists of a 24-segment LED laid out in a circular pattern. You can quickly and easily determine the current status of the Rec/Overdub/Play modes. With a maximum 12 minutes of stereo recording time, the RC-1 is capable of capturing any extended performance that you can create or imagine! The stereo in/out jacks can be used with stereo effects and amplifiers. The RC-1 is an especially great partner to start enjoying looping!